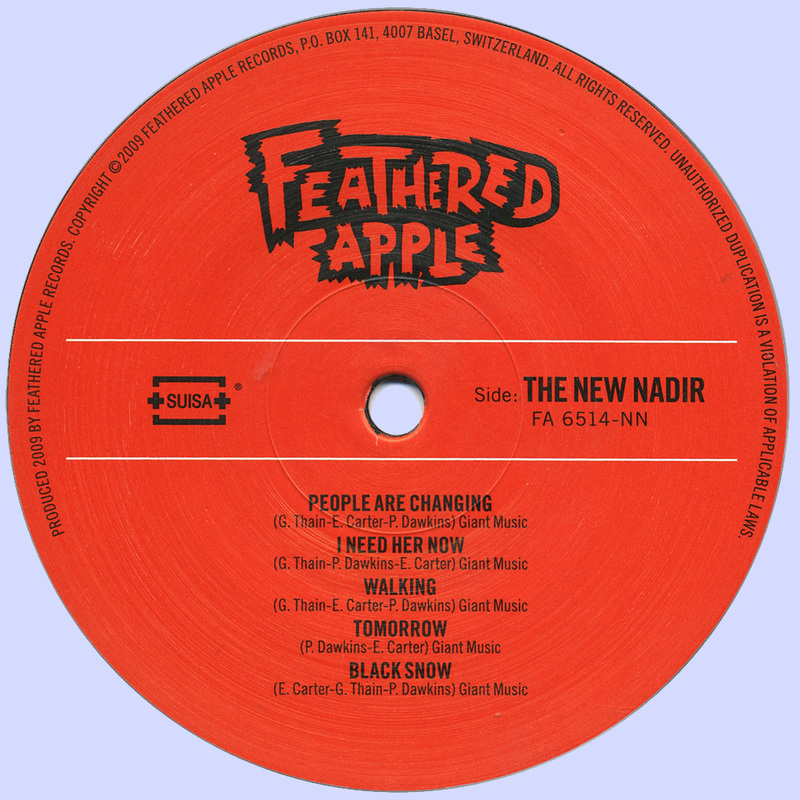 Groundbreaking split LP including 5 killer previously unreleased 1967 freakbeat/rnb/garage studio tracks by the legendary New Nadir featuring Ed Carter from San Francisco, California on lead guitar and vocals (pre The Beach Boys); Gary Thain from Christchurch, New Zealand on bass (pre Keef Hartley, and Uriah Heep); plus Peter Dawkins also from Christchurch, New Zealand on drums (the greatest record producer from down under). 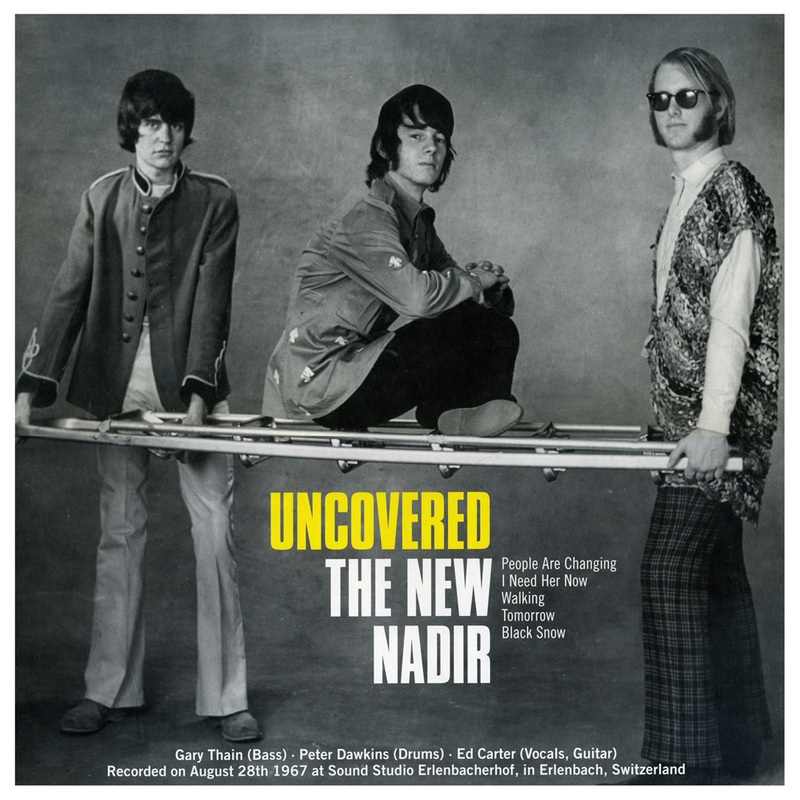 The New Nadir have played some celebrated clubs in London such as the Speakeasy where they gigged a few times with Jimi Hendrix, who was supposed to produce their first record for the UK Polydor label, however after Ed Carter had received the offer to join The Beach Boys, the band split and nothing was ever released. 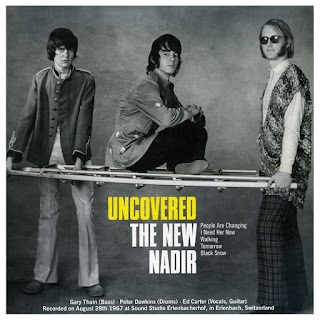 The five tracks by The New Nadir on this LP were recorded on Monday, August 28th 1967, at a professional Swiss recording studio near Zurich, and capture them in great mood at their fantastic first recordings. 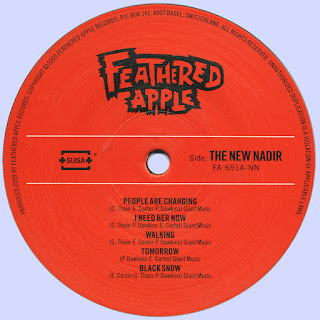 The songs range from top freakbeat/garage masterpieces (TOMORROW, as well as I NEED HER NOW), thru unique eastern influenced freakbeat tracks with raga riffs (BLACK SNOW), and onto the pop-art sound of PEOPLE ARE CHANGING, and the rambling rnb/freakbeat/garage guitar instrumental WALKING. The LP is highlighted by the monster previously unreleased freakbeat track LOVE IS NOT A GAME, which was recorded by the pre-New Nadir outfit Me And The Others in November 1966, at Regent Sound Studios in London. This could easily hail as one of the greatest freakbeat tracks which was ever produced in the UK. Me And The Others were a mid 60s beat/rnb/freakbeat band from Christchurch, New Zealand featuring Peter Dawkins on drums, and vocals (ex The Strangers); Dave Chapman on guitar, Gary Thain on bass (ex The Secrets, and The Strangers), as well as Paul Muggleston on lead vocals, guitar, and organ (ex The Secrets, The Dynamics, Atlantics, etc.). The LP is rounded out by 5 choice never before released live tracks from a Me And The Others gig in Germany that was recorded in January 1967: The amazing Graham Bond Organisation type of guitar - organ instrumental COMING HOME BABY, plus fantastic kiwi modbeat/garage/freakbeat versions of YOU BETTER RUN, HOLD ON I’M COMING, and CAN’T TURN YOU LOOSE, as well as the killer garage punk original track EVEN GREEN ONES. Gary Thain later joined The Keef Hartley Band (1969-72), also worked with Miller Anderson in his solo album (1971) and Uriah Heep (1972-74). After continued struggles with health and drug problems, Gary died December 8, 1975, in his flat at Norwood Green at the young age of 27.